What and where is Mestre? Mestre (pronounced May-stray) is the mainland town connected to Venice by rail and road bridges over the lagoon. We include a Google map of Mestre at the foot of this page. Some tourists stay there as a cheaper alternative to Venice, although we don't recommend this option (see our advice on where to stay). Mestre is everything Venice isn't: modern, ugly, traffic-filled, ordinary. Administratively it is part of Venice (Venezia); a kind of mainland suburb. However it has a history as a separate town, and it has a very different character. Mestre's history goes back to the Middle Ages, though it was always overshadowed by its powerful neighbour Venice. Unlike Venice, it had no lagoon to protect it, and the fortifications here were battled over, conquered, destroyed and rebuilt in the warring and squabbling that went on throughout mainland Italy for centuries. Even after the town was taken over by Venice in the fourteenth century, it was still at the mercy of occasional attacks from Venice's enemies. In the 1920s Mestre was absorbed into the Comune di Venezia, losing separate status as a town. But despite the loss of administrative autonomy, Mestre found itself becoming a focus for migrants. During the 1920s and 1930s a big port and industrial complex was developed on the shores of the lagoon at Porto Marghera, aiming to boost the local economy. Mestre, right next door, grew as workers arrived from all over Italy needing somewhere to live. The 1960s and 1970s saw a rapid growth as local Venetians opted to move over the water. Mestre was still administered from Venice, which is perhaps why there seems to have been little planning control over the ugly housing and industrial developments springing up all around town. The population grew to over 200,000. Nowadays the town has worked at creating more of an identity for itself, but to visitors it is still a brutal residential twin to neighbouring Porto Marghera, the industrial port complex which so horrifies the new arrival in Venice. Today the population of this mainland conurbation is nearly three times that of island Venice. Basically, Mestre offered - and still offers - the kind of life many Italians want. Here they can live in modern houses or apartments, with space for their children to play. They can drive cars or go cycling. In their thousands they escaped from poky dark flats at threat from high water and rising damp and chose the brave new world of modern Mestre. There were jobs too, working at the busy industrial docks. Nowadays in the daytime the flow is reversed: many of Venice's workers - even her gondoliers - commute in each day from Mestre. If you are at Piazzale Roma in the early morning you'll see them; lots of full-blooded Venetians pouring off buses into the city of their ancestors, heading along those inconvenient canals to work in hotels, souvenir shops and restaurants: to service the every-expanding tourist industry which has nearly taken over Venice. If you stay or live in island Venice, you won't have many reasons to go to Mestre. You may pass through on the train but the town doesn't hold many attractions. The principal exception to this is shopping. Mestre has normal shops with normal prices. Even though there are now chain stores and supermarkets in Venice, Mestre still usually offers better options. The most useful shopping destination is Mestre's newish shopping centre, Centro Le Barche. Inside you'll find an H&M clothes store, which is ideal if you need to replenish your suitcase cheaply. There is a big Feltrinelli bookshop (with a travel section and books in English), a large Coin department store and a supermarket. The shopping mall even has free toilets, unheard of in Venice. A narrow pedestrian street leads from the shopping mall to Piazza Ferretto. Along this street and under the portico of the square you'll find more cheap shops for make-up (a branch of Sephora), underwear and so on. 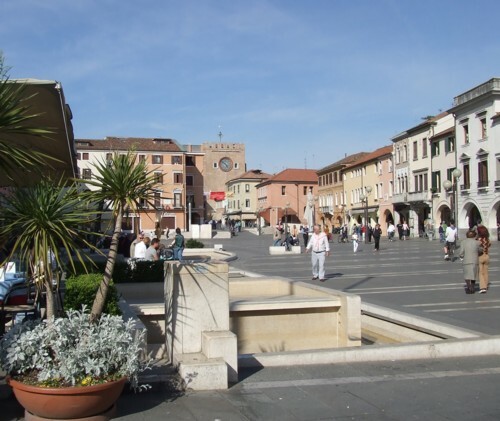 Mestre's most appealing feature is Piazza Ferretto, the town's main square. Large, long and attractive, this comes as a suprise if you've only believed the bad reports of Mestre. There are cafes to while away the afternoon and a general friendly bustle. The square is pedestrianised, and surrounded by interesting and historic buildings including the eighteenth century Chiesa di San Lorenzo, the town's most important church. The restored clock tower, the Torre Civica (also known as the Torre dell'Orologio), at the end of the piazza is Mestre's principal monument; originally part of the town's medieval fortifications. Beyond the tower you'll find some stretches of arcaded street which are further reminders of the town's history. A much newer attraction can be found towards the shore of the Venetian lagoon. Parco San Giuliano is a new public park built on former wasteland, with trees, paths and views over the lagoon. In 2007 it was the site of the Heineken Jammin' Festival, brought to a sudden halt after a freak storm. There are no other real tourist attractions in Mestre, although there is talk of a museum in the future. Apart from shopping, another reason why Venetians might head to Mestre is for entertainment and nightlife. There are more options here, including several cinemas and nightclubs. If you're planning a late-night dancing trip you should do your research and be sure you have your transport planned; some events are outside the centre and only reachable by car. Buses between Mestre and Venice are constantly crossing the lagoon bridge (Ponte della Liberta) to Piazzale Roma, Venice's bus terminus. They're run by ACTV, who have an information kiosk between the square and the Grand Canal where you can get directions and buy tickets. Bus number 4 is a useful service, crossing the road bridge, turning right into Mestre along the straight Corso del Popolo and passing Piazza 27 Ottobre where you can alight for Le Barche shopping centre and the heart of town. The railway line from Venice passes Mestre station, and is a useful alternative if there are traffic problems (road accidents can close the road bridge into Venice for hours). The station in Mestre is a short distance from the centre of town, though, so buses are generally more convenient. Mestre has good travel connections; buses and trains between Venice and the rest of Italy almost all stop here. The ATVO Ryanair bus from Treviso Airport generally stops in Mestre by the station (consult the driver), as does their service for Cortina d'Ampezzo in the Dolomites. Venice Marco Polo Airport is very close to Mestre, and there are cheap ACTV urban buses (number 15 to Mestre railway station and number 5 into Venice via Parco San Giuliano) as well as a direct ATVO 'Fly Bus' connection between the airport and Mestre station. Mestre is sprawling and quite confusing, so get directions from your hotel if you're staying here. There are plenty of hotels in Mestre for travellers who are on a tight budget, are desperate to be nearer the airport, or are planning onward travel and need car parking. Visitors should be prepared for a very different experience to the Venice of postcards, though. If you possibly can, we'd advise staying in Venice proper.